Around Christmas time in Sweden, and other Scandinavian countries, one of the biggest celebrations occurs on December 13th, Saint Lucia’s Day. Lucia is an ancient mythical figure with an abiding role as a bearer of light during the dark Swedish winters. 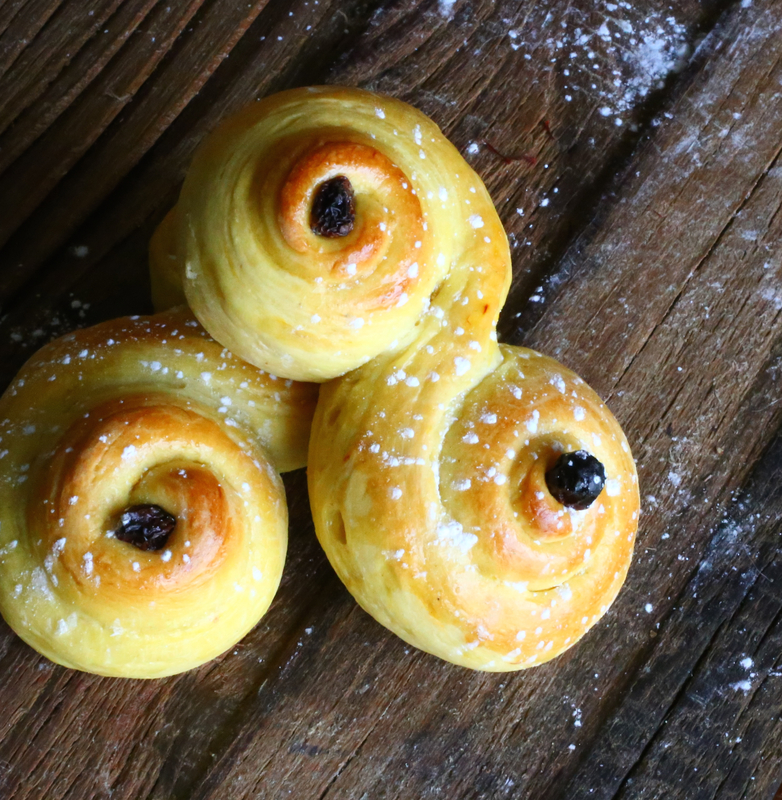 A popular food eaten on Saint Lucia’s Day are mildly sweet saffron-flavored buns, lussekatter (Lucia cats), shaped like curled up cats and with raisin eyes. Traditionally, the eldest daughter in the family rose early, wearing a white robe, red sash, and a crown of lighted candles. She was to wake the family by singing Santa Lucia (several versions of the song are now familiar in many languages and countries) while serving them coffee and warm saffron buns to usher in the Christmas season. Nowadays boys and girls don white gowns and a wreath with electric candles to sing and celebrate the mythical Saint Lucia. I first learned about these traditional Swedish Christmas buns from a Swedish friend while I was living on the island of Guam many years ago. 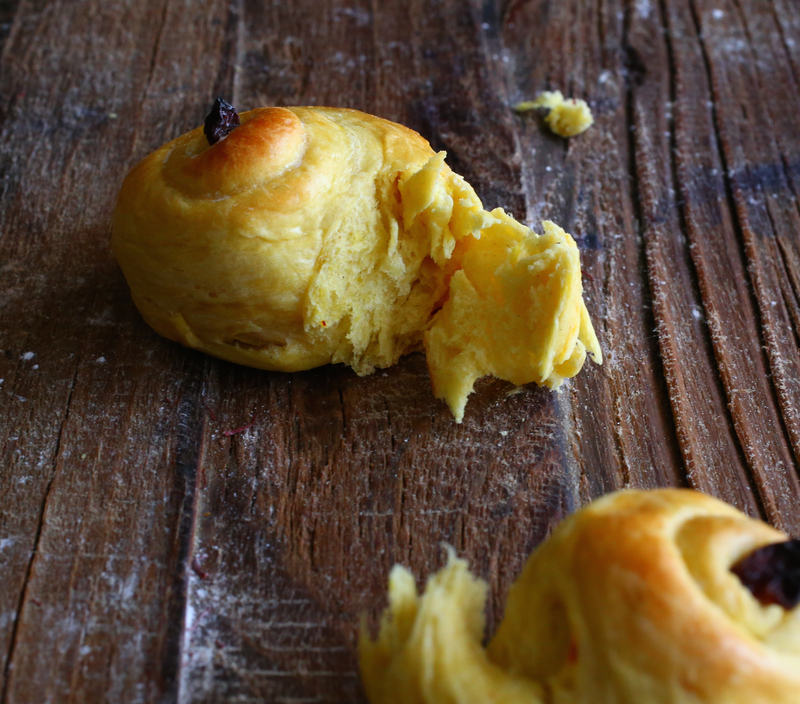 One December, she excitedly told me about this beloved tradition and then we celebrated by making warm and wonderful saffron flavored buns for Saint Lucia’s Day. The memory was as warm and sweet as the buns I made today. In a bowl, combine dry yeast, salt and saffron. If using saffron threads, you can first break the threads a little by crushing in a bowl (or mortar) with a little sugar. Melt butter in a saucepan, remove from heat then add the milk, stir. Add milk to bowl of yeast, stir. Combine flour, sugar and cardamom in a large bowl. Create a well and pour in the liquid mixture. Mix with a wooden spoon or mixer until the dough forms, adding more milk or flour until the dough no longer sticks to the side or your hands and has formed into a large ball. Cover the bowl with a kitchen towel and leave to rise in a warm place until its double in size, about an hour. Transfer dough to a lightly floured work surface. Knead dough and roll it into a large log. Cut dough into 15 pieces of equal size. Using your hands, roll each piece into a long and thick string about ½-inch wide. Shape them into double spirals, rolling both ends tightly in opposing directions. It should look like and S-shaped bun. Place buns on a parchment lined baking sheet and cover with a kitchen cloth and set aside in a warm place to rise again, for about 20 minutes. Meanwhile, preheat oven to 425F. 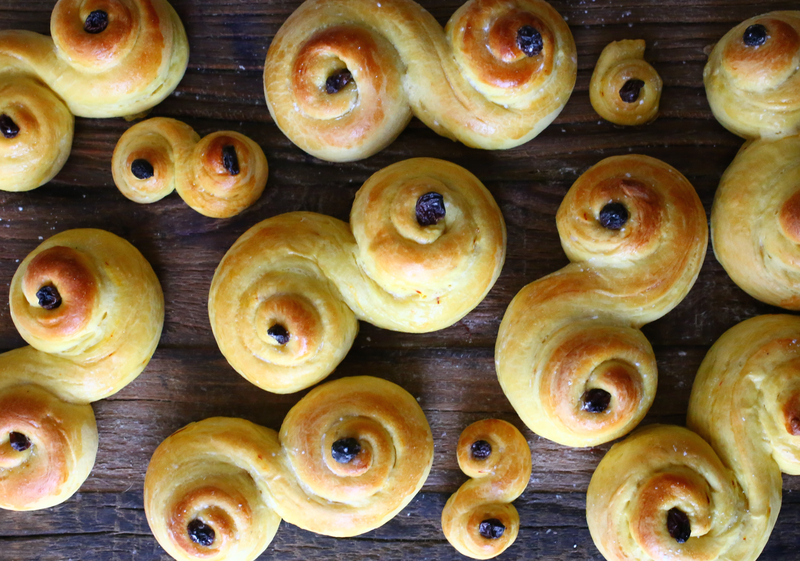 Using a pastry brush, glaze buns with egg or water and place a raisin in each eye of the circles/swirls. Bake until golden brown on top, about 5-9 minutes, depending on size. Allow to cool on wire rack, serve with tea, coffee or hot chocolate. The saffron buns taste best fresh out of the oven, of course, but can be stored in an airtight container for up to a week. Notes: The next time I make these I might add a little more yeast as that might make them a little lighter in texture. Thank you Fae! Great that you were reminded of the Italian song as it is quite similar to the one song in Norway. There are apparently many versions of Santa Lucia in different languages. I’m familiar with the one sung in French. We used to play it at home as part of my son’s bedtime routine. I believe all versions of the song, Santa Lucia, have the same tune and are about light and water, just slightly different words. Thank you for this lovely recipe with gorgeous pictures! I am of Swedish descent, but we never celebrated Santa Lucia– they do at the Waldorf School, though….. I am making another Swedish cardamon bread this morning, so maybe I’ll try these too! Thank you Liz! I find this Swedish tradition so charming and endearing. What do they do at the Waldorf School to celebrate? Do the kids dress up in white and sing Santa Lucia? Although we’re not of Swedish descent, I think I’ll start baking these curly rolls every year to celebrate Santa Lucia. I might even dress my little one up in white and teach him the song! 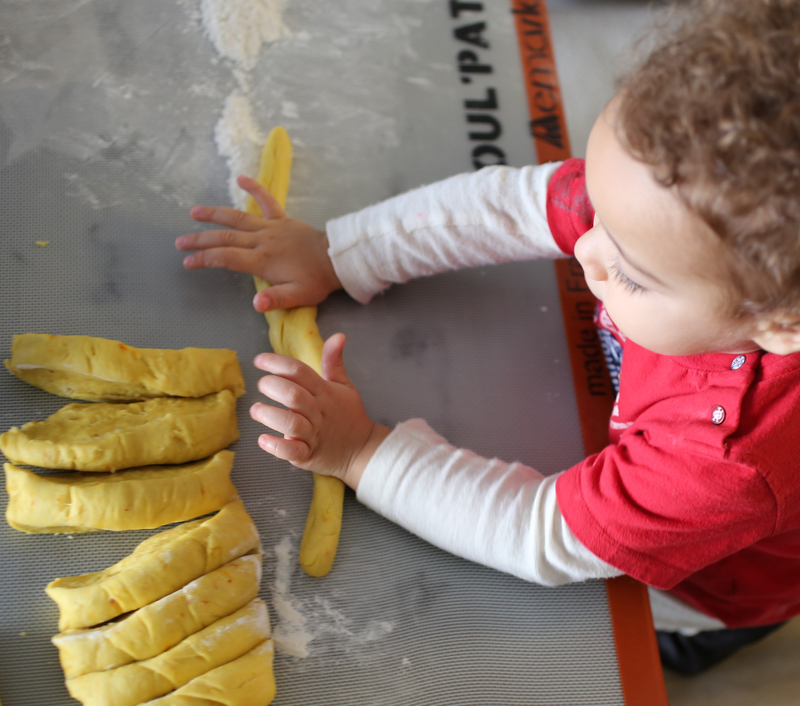 🙂 This morning I added a picture of him helping me to roll the buns. I forgot to add it when I posted this yesterday. Please let me know if you make these buns. I’d be interested to know if the texture is right. Although I know what they’re supposed to look like, I’m not sure if i also got the taste and texture right! Happy Santa Lucia Day! and happy baking! Thank you Nohemi! Glad you rnjoyed this. Please let me know how they turn out! These are gorgeous. What a cool tradition. You really are a talent. Thank you Amanda, glad you liked these. I think it’s a pretty cool tradition too. I’ll be making these again, year after year. Thanks so much.